For a long time, I wanted to try out the game Strange Aeons. Sadly, every time I saw it at a convention, it always filled before I got to the sign up sheet. 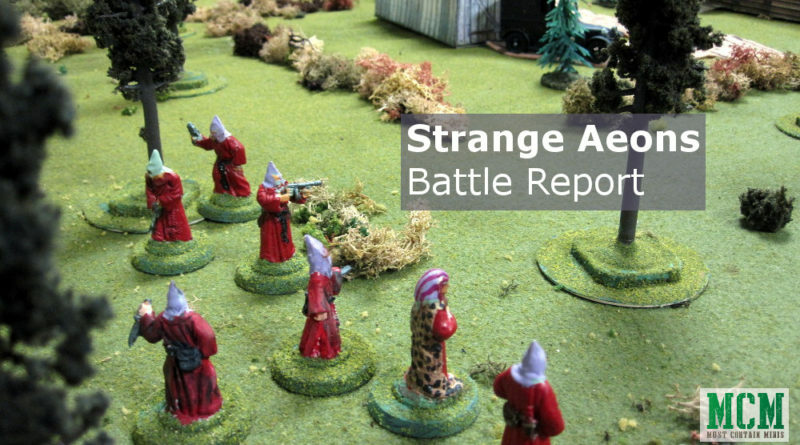 I finally got to try out the Strange Aeons (version 2) at Broadsword 5. 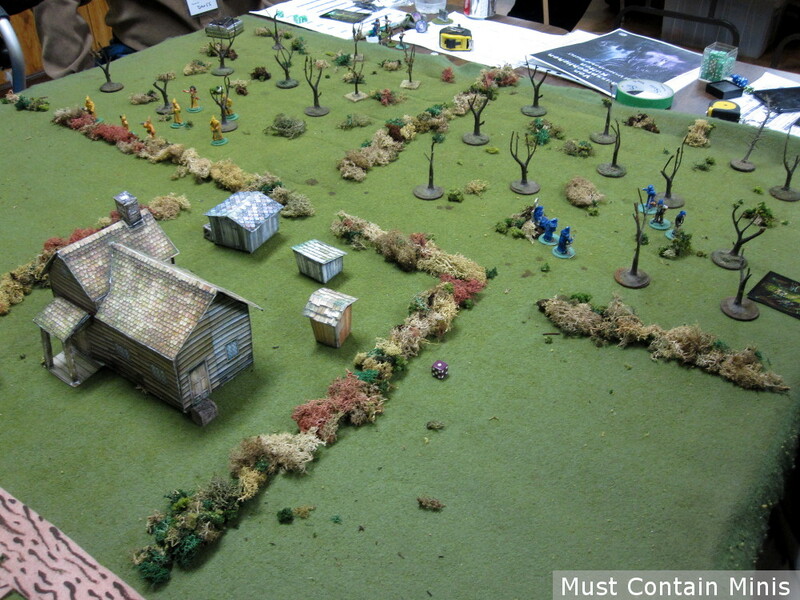 This post is a Battle Report of that game. Lembit Tohver acted as the game master for this demo and I had a fun time giving it a try. I wrote about Von Unaussprechlichen Kulten before. As a quick note, the Strange Aeons 2 game is the same gaming engine as what Von Unaussprechlichen Kulten runs on. How anyone remember the name of that game, I do not know. 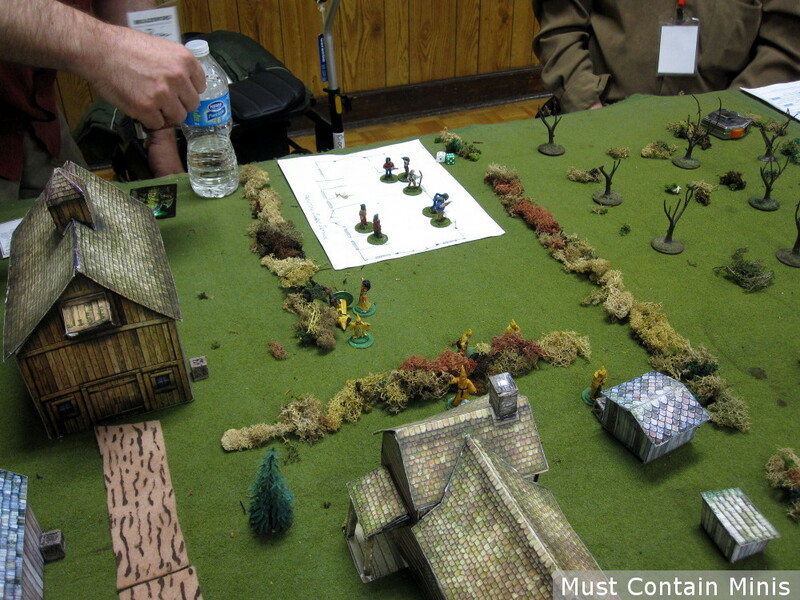 What I played at Broadsword 5 was Strange Aeons 2. If you are interested in either game, be sure to check out the Strange Aeons’ Website. 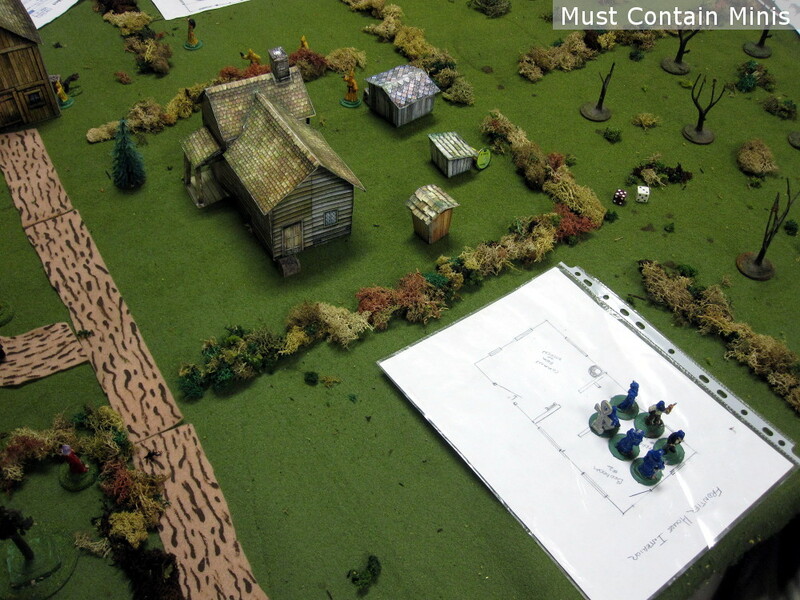 In this demo game, every player (there were four), got a different gang of cultists. The abilities and spells were slightly different between the groups. Below is the group that I lead. 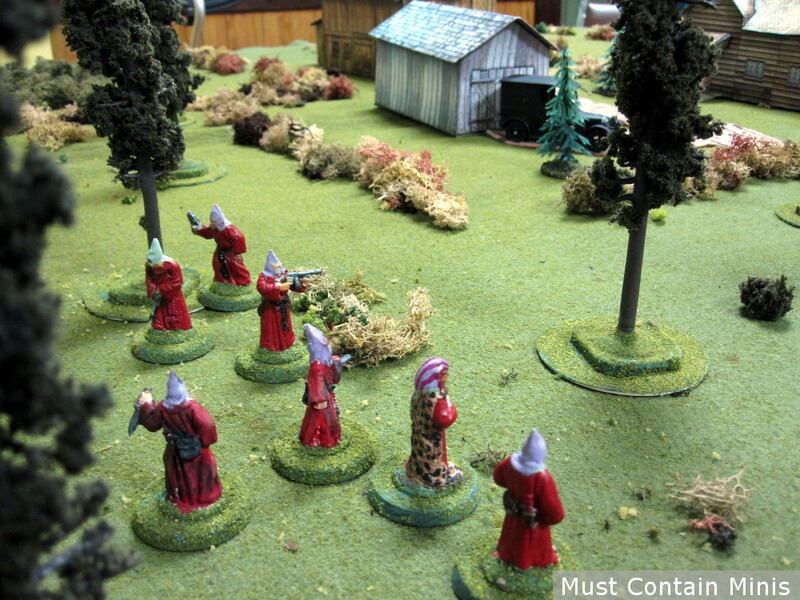 My Cultists in this Strange Aeons Battle. 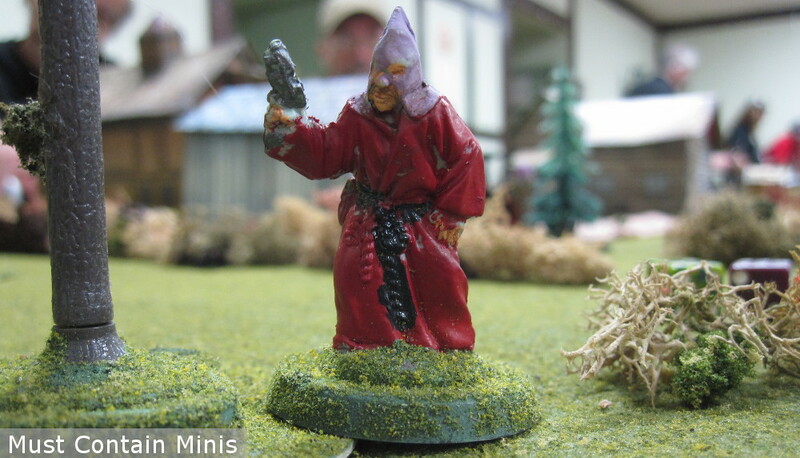 In this group, I had a Magus (who knows mysterious spells), a Leader (armed with a pistol), and five cultists. Two of those cultists carry pistols, one a hunting rifle, one a shotgun, and one unfortunate soul brought just a knife to this gun fight. The other groups were similarly armed with some differences. One group had mutations already from their dark god. Another had a priestess with more powerful spells than my own. It was nice to see that the groups were evenly matched yet different in this demo game of Strange Aeons. The mission in this battle was simple. Enter an abandoned farm under the cover of darkness, find some ancient artifacts to help your cult communicate with the dark gods of Cthulhu and get out. Your leader and Mage had to survive and you lost points for losing people. You also had to be off the board after a set number of turns. The table as set up from my corner. The table looks pretty good and shows that you can get a really good effect with paper terrain. To start, my group gathered in the woods under the cover of darkness. Unannounced to them, three other cults would come to the same abandoned farm in search of artifacts for their dark gods. Those gods are most likely connected to Cthulhu of course, but all the groups worship in their own ways. Here is my cult’s deployment. My plan was to start by searching the car and garage. My force split up into three groups and started their search. Two of the other groups moved in on my position from the other side of the house. This game was a free-for-all so the cults would engage all groups by the end. Even closer to my group was this group of mutated beings. 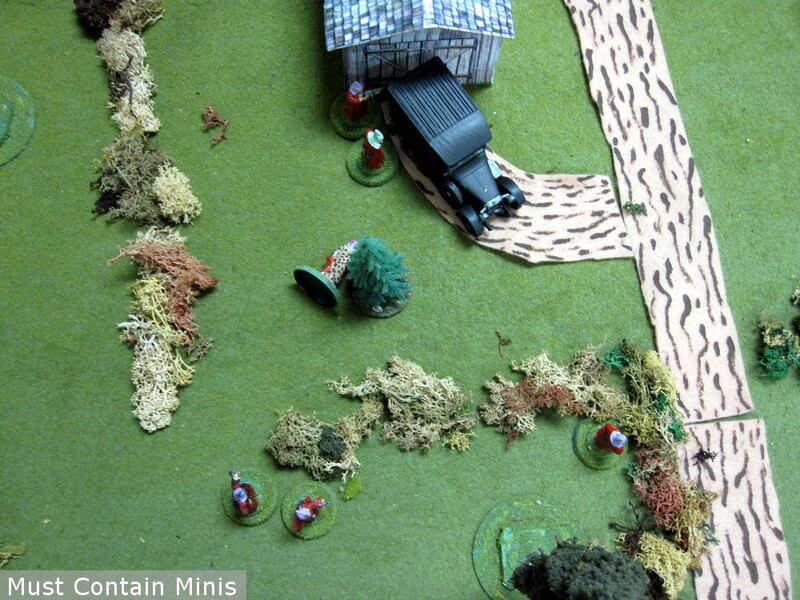 The man holding a shot gun took a shot at my Magus. It was a direct hit! It didn’t kill my Magus outright, but did take him out of action for a short while and changed my strategy from an aggressive run on the objectives to more of a strategic game of hide and seek. Not a good start for me. 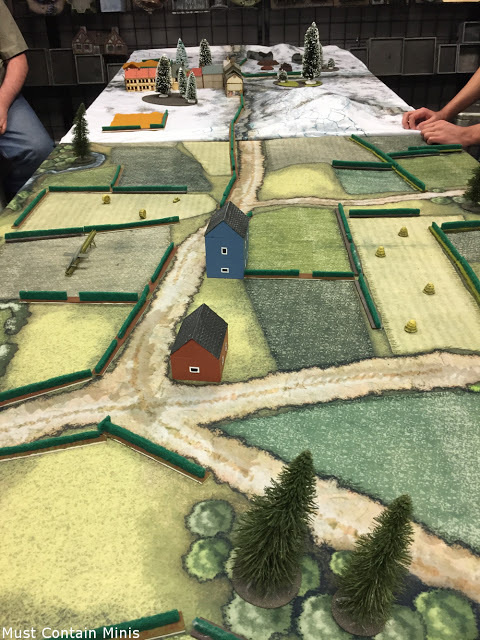 With my main character almost completely taken out at the top of the game, I was wondering if it would be time for me to find another gaming table to get in on another game. Fortunately for me, things improved from here. The yellow cult would now engage with the mutants that shot down my leader. As an interesting note, the white paper there was used to represent the interior of the barn. Two of the mutants took shelter in there and started firing at the yellow cult. The yellow Priestess possesses awesome powers and proves herself a force to be reckoned with (even on her own). 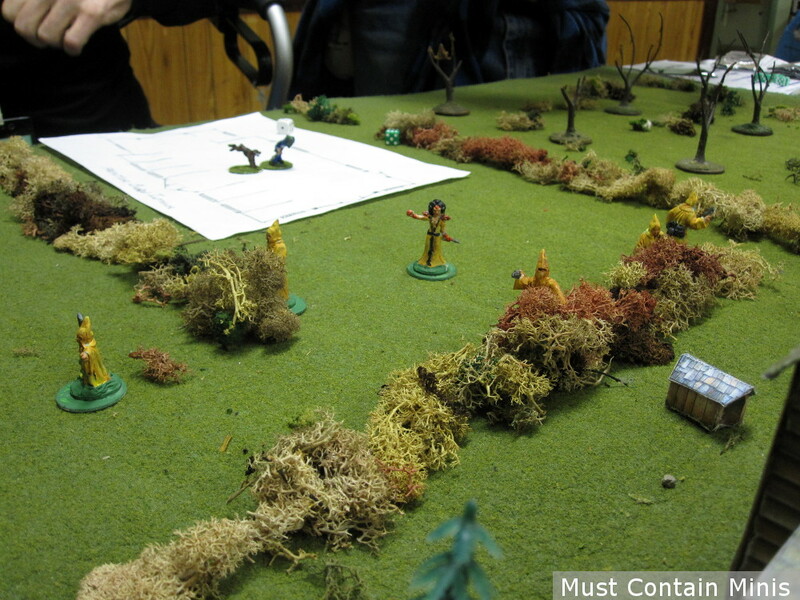 The mutants shoot down one of the yellow cultists. Like the shot on my leader, it is not a lethal shot, but enough to want to either pull back or retaliate. The barn on the left is where the mutants are hiding. The mutants now fully occupy the barn. 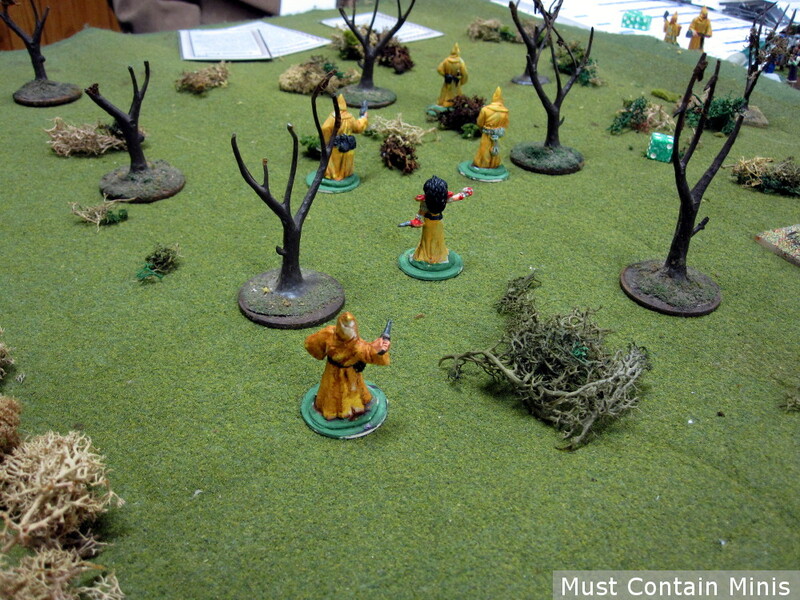 The yellow cultists rush towards better cover while their Priestess goes to help the member that was shot. Notice that the yellow group made their way to the chicken coups in the backyard of the house. 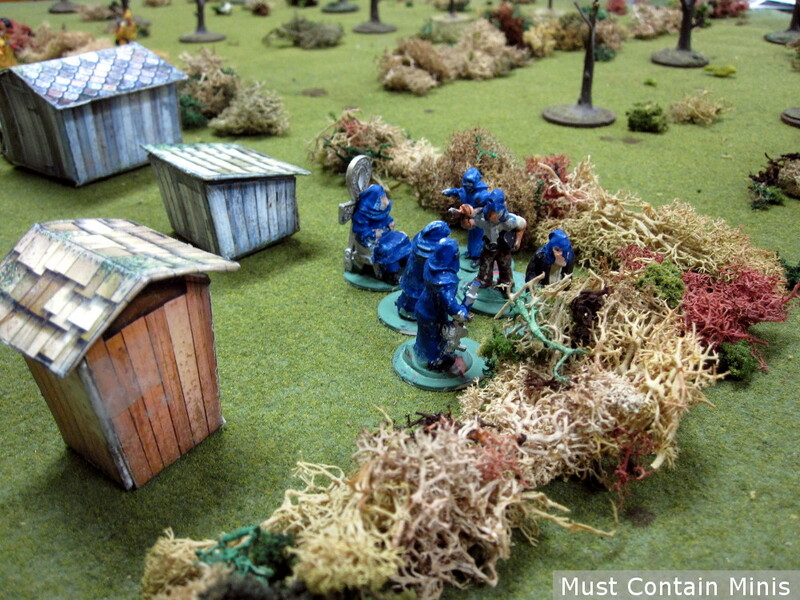 The blue cult moved along the board undetected to the others (remaining out of line of site). Their location, the chicken coups. Why would their be Cthulhu related items in a chicken coup, I do not know – but that was where they were searching. The blue cult moves in hidden from the other groups. Now the yellow cult approaches them. 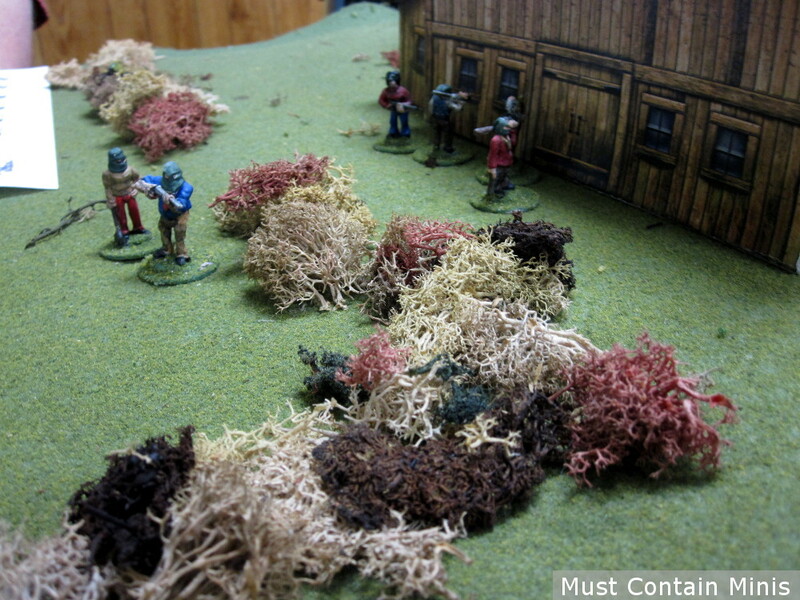 The Blue Cult runs into the house and attacks both the yellow cult and my (purple cult) from the windows. Behind the chicken coups, you can see a dead yellow cultist. Again, a nice use of paper to represent the interiors of buildings. My group mostly stayed out of site and searched for artifacts in the garage in car. We tried starting the car, but it would not work. My guess is that it was out of gas. We found a couple of objects. Due to heavy fire (and fear), my group never left the safety of this area. The blue cult and mutants also found a number of artifacts in the house and barn. Meanwhile, yellow focused more in engaging in battle rather than finding objects. I don’t even know if yellow found any artifacts, but in the end yellow won because they were the only group to clear off the board in time. Their Priestess and Leader also survived the ordeal. The Yellow Cult retreats from the board and wins for being the only group to clear the board in time. My group did not clear off in time and neither did the other two factions. Congratulations to yellow! Everyone paints at different abilities and I really like seeing painted miniatures on the table. Lembit’s collection features the official miniatures for Strange Aeons. These are minis I had not seen before and I wanted to include some close up shots of those miniatures in this post. 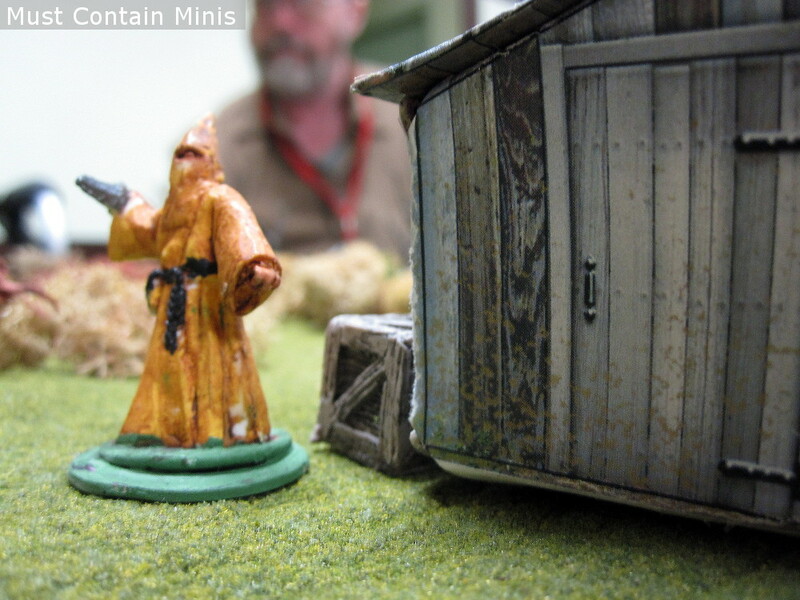 A close up shot of one of the cultists in my group. Another one of the minis from my cult on the table. 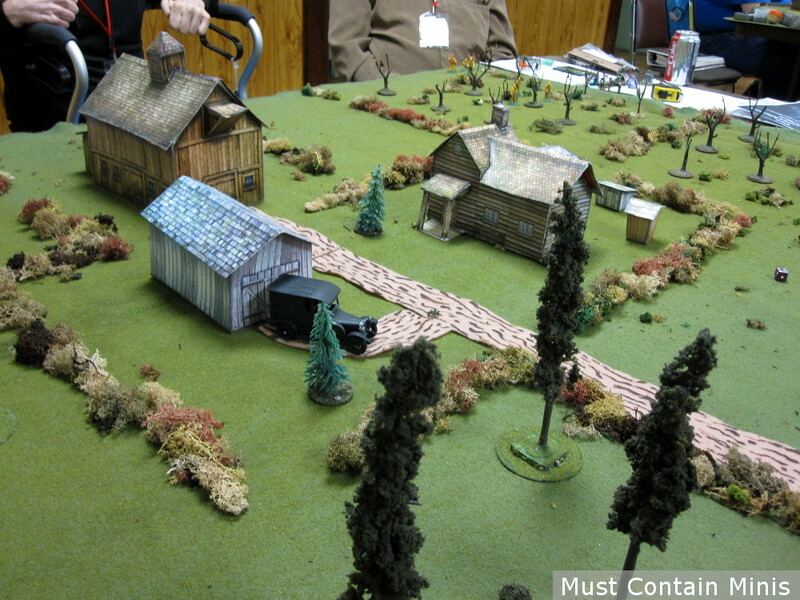 This battle board is yet another example of someone making a great looking table using paper terrain. 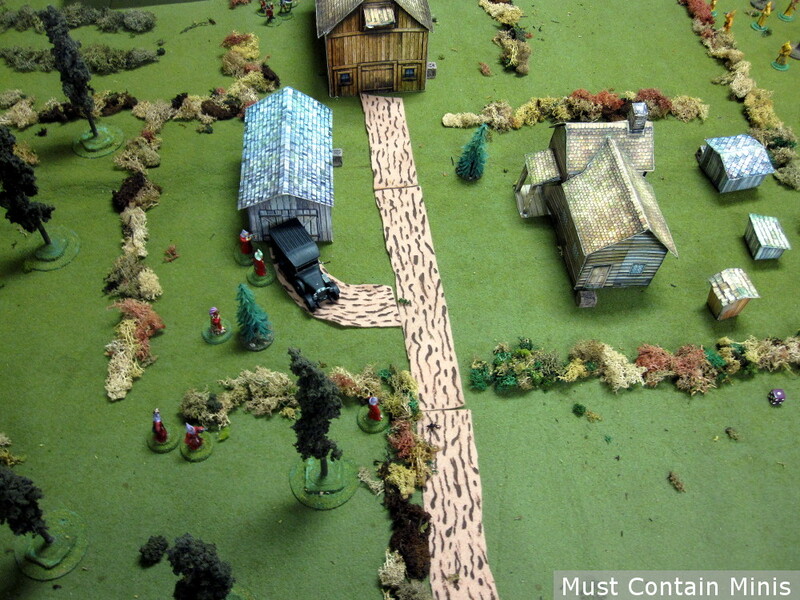 You don’t need to spend a ton of money on resin or plastic buildings to get in on wargaming. Playing new games is something I always enjoy. 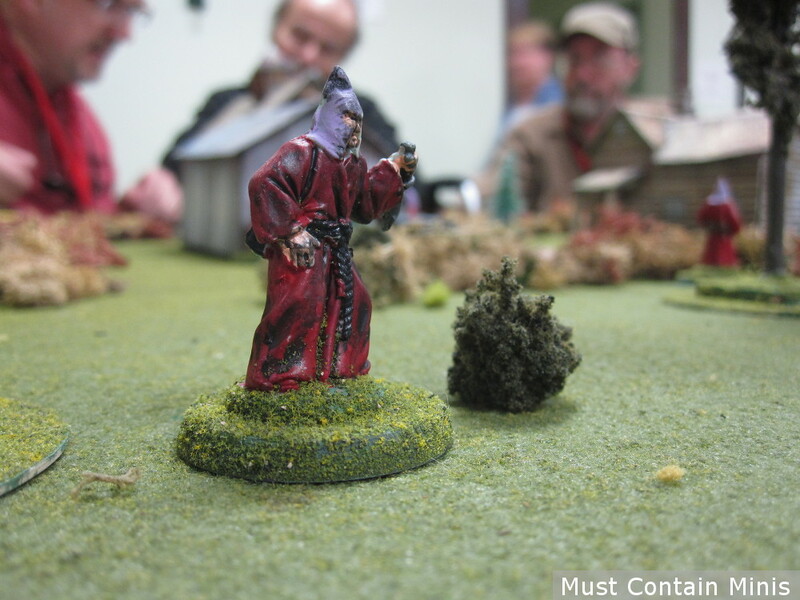 I just love going to local conventions like Broadsword and getting in on a participation game or two of games new to me. 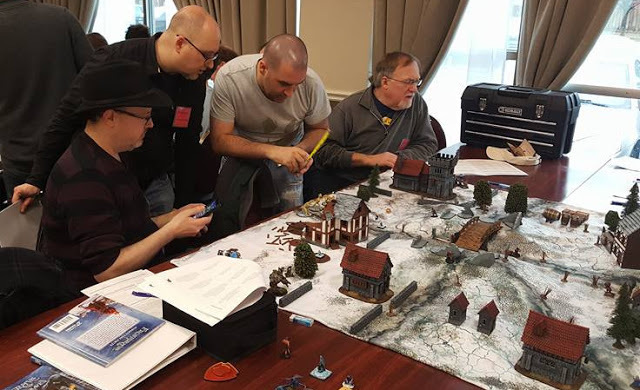 Special thanks goes out to Barnaby Ore for organizing the Broadsword Events and to Lembit Tohver for allowing me to take pictures of his minis and trying out this game. By the way, great table Lembit. 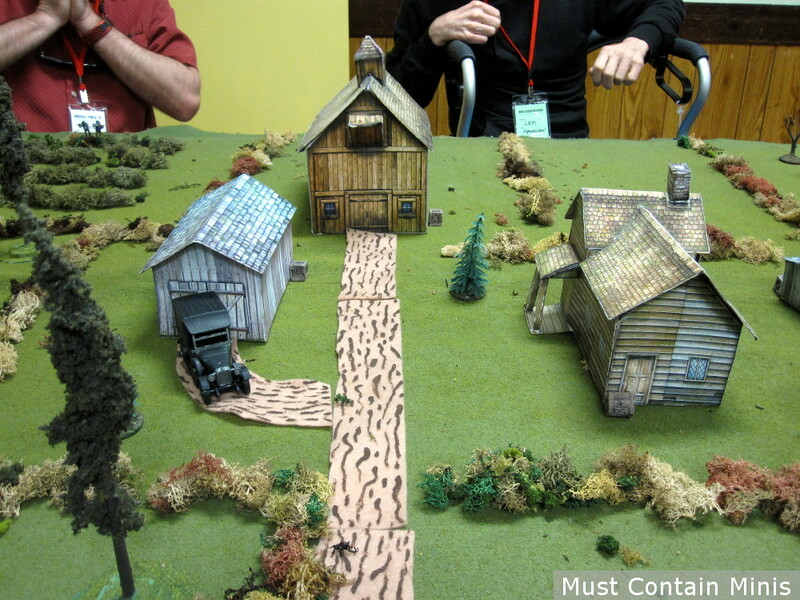 Love your use of paper houses and scatter terrain to make up a really nice looking board. Just a reminder to the readers of this website, you can help support Must Contain Minis by buying products through our Affiliate Links. We have affiliations with DriveThruRPG, the Wargame Vault and Amazon. The Wargame Vault now sells files for people who own laser cutters. Both the Wargame Vault and DriveThruRPG also sell STL files for people with 3D Printers. If Paper Terrain interests you more, they sell that too. If you buy from any of these sites after following a link from this site, Must Contain Minis gets around 5% of the purchase value to help fund the site. If you like that cultist feel, how about the Starspawn war with the Elder Things? That’s a sharp looking web-page you have there. I certainly like Cthulhu based minis and games. I wish you the best of luck and thanks for the comment. Thank you for the great AAR. It is always a pleasure for me to run these games at the cons. Thanks Lembit. I certainly had a good time trying out the game. Ironically, “Unausprechlich” means “unpronounceable” in German. However, in this context “unspeakable” is probably closer to the actual meaning. So the title means “unspeakable cults”. Thanks for the comment Ralph and I hope you enjoyed the Battle Report. “Unspeakable Cults” may be easier to remember….and pronounce, but “Unaussprechlichen Kulten” (spoken in an overblown, Hollywood German accent) is so much cooler!